On Thursday night, the Round Rock City Council voted unanimously to give Mayor McGraw the authority to cancel the red light program. It sounds like he’s going to do it. Before the roll call, McGraw said something very, very smart. The purpose of the red light cameras when they started was to reduce deliberate red light runners, not punish people who accidentally missed the light by a fraction of a second because of circumstances that everybody meets once in a while. But, a lot of people were not paying their red light camera fines. And the Mayor realized that very likely, the people paying their fines are not the people we meant to target. The people we meant to target were the people who are now also not paying their fines. It is always very easy, when faced with deadly lawbreakers, to focus on the easy catches, the people who aren’t being deadly to begin with. After last week’s shooting, for example, the left wants to punish law-abiding gun owners. Well, that’s no surprise, they always want to punish law-abiding gun owners. They don’t like putting more criminals in jail, or even, sometimes, calling criminals criminals. Those are hard choices. It’s a lot easier to target non-criminals; they are once again literally discussing banning all guns. A kid on the playground throws a rock at another kid on the playground. The teacher gives rocks to all of the kids since, after all, only a good kid with a rock can stop a bad kid with a rock. This is typical leftist thinking: if you aren’t in favor of complete surrender, you want total war. This has been a tactic—or intellectual failing—of the extreme left since at least the writing of Advise & Consent, which I reviewed yesterday. A kid on the playground throws a rock at another kid on the playground. 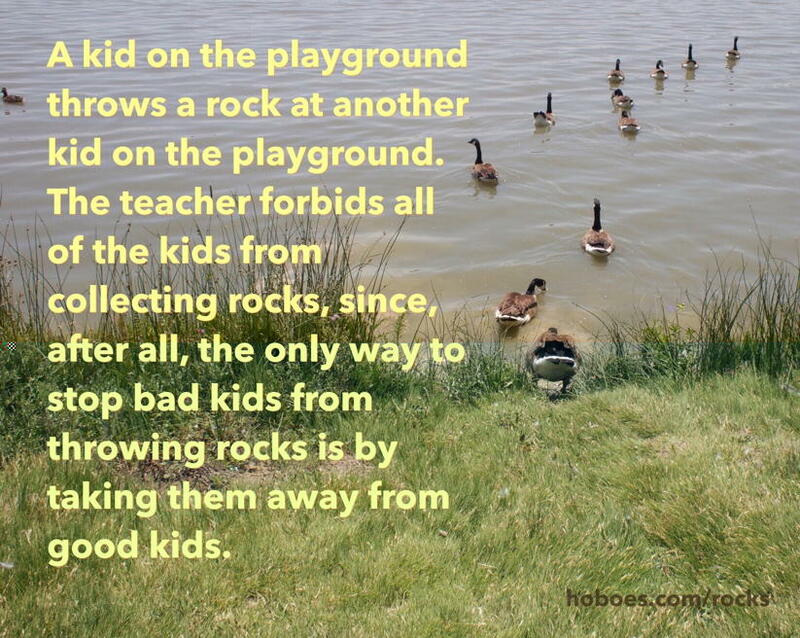 The teacher forbids all of the kids from collecting rocks, since, after all, the only way to stop bad kids from throwing rocks is by taking them away from good kids. A ban on rock collecting is not going to stop rock throwing any more than a ban on firearms ownership is going to stop murderers. The bad kid will still throw rocks, pipes, chains, whatever happens to be at hand. Murderers will still use gasoline, cars, lead pipes, arson, whatever helps them commit their murders. But when you have blocked from your mind the notion that the bad should be punished and sometimes even separated from the rest of society, criminals are harder to deal with. The good kids are easy to deal with: make the rule and they’ll follow it. It isn’t helped by the way popular media tends to treat firearms nowadays; imagine if Chekov’s rule extended to rock collectors (as he intended it to), and that every geeky geologist in movies and novels eventually had to face their collection used for evil. What law-abiding gun owners want is for murderers to be punished; preferably while they’re still at the rock-throwing stage and before they kill anyone. And then, rather than forcing everyone to carry firearms as the meme suggests, allow those who pass the stringent concealed carry tests to carry them, so that future murderers will be deterred from murder. Because we know that the laws against firearms will work about as well as the laws against violence. The only people they stop are people who aren’t prone to violence to begin with. But it’s a lot easier to leave the rock-thrower on the playground to terrorize everybody, and instead punish the good kids who follow the rules. It provides a sense of accomplishment, even though the accomplishment was just making everything worse. The criminal’s still out there, and has more freedom to be a criminal. In response to Round Rock vote to terminate Redflex contract: Round Rock will, this coming Thursday, consider a resolution to terminate their contract with Redflex for red light cameras. I think that’s a great idea. This Senatorial procedural could be straight from Dumas, and the themes hidden in the action are timeless. Red Light Cameras and rock-throwing children last modified October 27th, 2015.